Amara’s growing stronger, Rowena’s still creating trouble, and the boys are still trying to figure out how the Darkness will affect the world around them. And, per tradition, the third episode brings Director!Jensen. Seems like a perfect combination to me! We focused on two female characters for this episode, Rowena and Amara. Both are out for their own good, both willing to use their power to achieve their goals. But I would like to think that they are not the same level of evil. And that distinction might help keep one safe for a bit longer, perhaps as an ongoing family trait. First up, Rowena. She’s motivated, I’ll give her that, but for all her motivation she often falls short. Sounds like she and her son are a bit alike in that respect. For Rowena, she wants to be seen as an ultimate witch, and that includes creating what she calls a Mega-Coven. But for all her self-motivation, others don’t take her as seriously as she wishes. Perhaps it’s the name, cheesy as it is. Or perhaps it’s because of Rowena’s tarnished reputation. Whatever the reason, Rowena is constantly underestimated and then is forced to show the extent of her power time and time again. But just as Rowena has others underestimate her, she often underestimates her son as well. She really thought she was done with Crowley, since she had cursed Cas and left him to finish the job. However, Crowley is a crafty demon. He hasn’t lived this long by being weak. And it really is a perfect match between him and his mother. Both are strong in their own right, both want the other dead, but both have always found a way out of the seemingly impossible situation. I do think one or the other of them will eventually have to be the loser, but I hope it’s not for a long, long time. They’re just so fun to watch! The boys’ interaction with Rowena this time around was great. 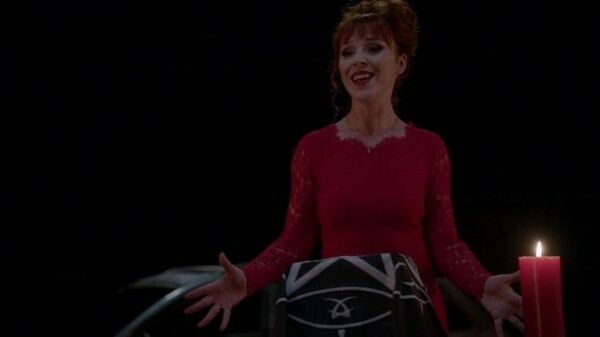 I liked that she was the one who pushed the revelation about Sam promising to kill Crowley in exchange for the removal of the Mark of Cain. 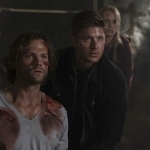 Once again, Dean knows that Sam is hiding secrets, despite the call for change. Dean is doing just as badly on that front, though. Both the Winchesters need to learn that being truthful with each other is a preferable situation than hiding information. The latter always ends with very bad things. Cas has his own problems, and he’s bringing them to the Winchesters’ front door. He’s still jazzed up on Rowena’s curse, so the boys keep him chained up in fear that he will go nuclear again. He does seem to suffer through quite a few symptoms, including having a seizure, before he manages to slip out of the bunker in what appears to be a search for Metatron. The older angel might hold the key to this whole Darkness situation, so it’s important to find out what he knows. 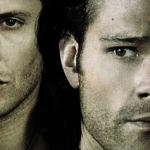 All the angels are trying to find him, so it’s going to be a race if the boys want to find Metatron first. But Cas is the Winchesters’ more immediate concern at the moment, especially since he delves downward into insanity by the time they locate him again. 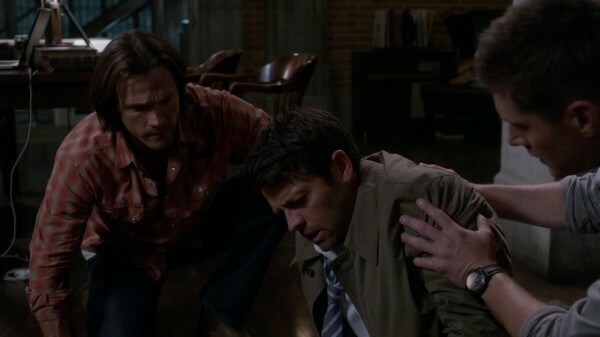 And the resulting beat-down that he gives Dean, as the elder Winchester tries to save the angel, was sad to watch. Even more sad was that Dean refused to let Cas heal him, as if he deserved to pay penance. No, Dean, you have to stop beating yourself up like that. As if they didn’t have enough on their plates, there is the issue with the always-hungry Amara. Crowley’s arranging for her education, as well as her feedings. And once she starts, she never stops. 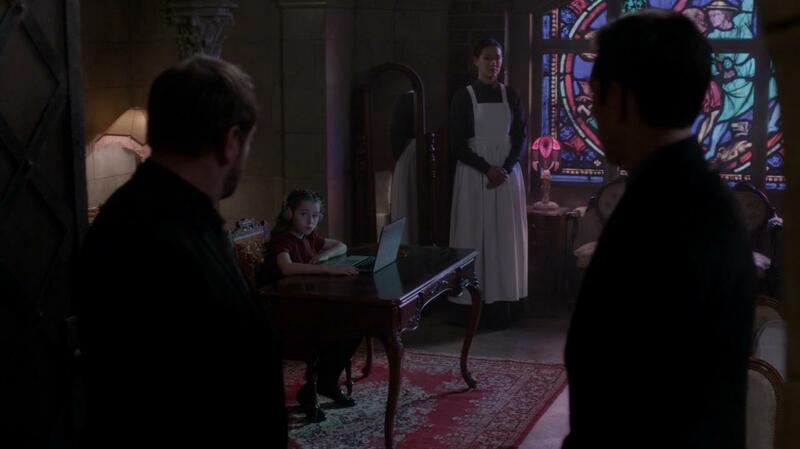 I’ve always said that Supernatural does creepy children well, and this time’s no different. I liken Amara to Famine’s hunger combined with Lilith’s evil sweetness. She doesn’t even have to be violent, just that quiet promise that she could kill you with a look. I fear that Crowley thinks he can control the uncontrollable. He’s already frightened of her and what’s to come, that much is clear. How much further will she go before she is in charge? It won’t be long! And I look forward to the eventual match-up between her and the Winchesters. They will try their hardest to come out the victors, but it will be a hard fight. We just have to wait and see how it all plays out.